6 pack of natural wood mills. Last week was a very busy week here and these are just a few of the pieces that I made and shipped out. 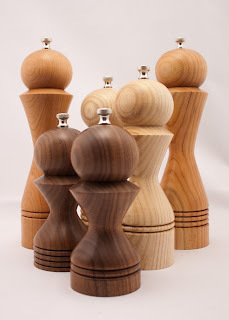 Here are six natural wood salt & pepper mills made in the Morrison style. From front to back they are 6″ Walnut, 8″ Ash & 10″ Cherry. Notice the beads or rings down near the bottom of each mill. They help to tell you whether the mill is for salt or pepper. One bead/ring means that it’s a salt mill and three beads/rings means that it’s a pepper mill. Their new home is at the Center for Maine Craft in W. Gardiner, ME. They also received a new shipment of wood pens too. If you are traveling in Maine on the turnpike (Rt 95) or on Rt 295 stop at the rest stop in W. Gardiner and you will find the Center on the left just as you enter the building. The Center is filled with very unique products that are made here in Maine by Maine artisans. If you get a chance stop by and check the Center out. You won’t be disappointed.